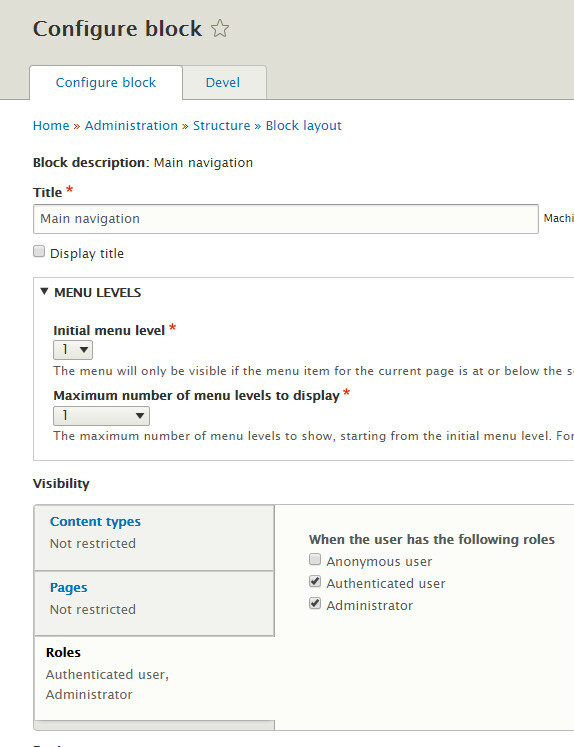 How can I create an user account menu link that shows up only to registered/authenticated users in Drupal 8? I do not want anonymous users to see it. For example, I want to have "add node" menu link. Long story short, you create 2 different Menu versions and give each version different visibility rules. Now create another Menu (/admin/structure/menu) which does not have the "add node" link. Then go to blocks (/admin/structure/block) in Primary Menu (Assuming you're using Bartik, may have a different name if you're using a custom theme) click add, and add the Menu you just created and configure it. PS: In pages you can restrict so it only shows up in certain pages. An "add node" menu link is only shown to users who have the permission to create such node. So if you give the permission to authenticated users, and not to anonymous users, you're done. If you have other samples of links that have a related permission, then use a similar approach for that permission (don't grant it to anonymous users). If some link doesn't have such permission, then go for the approach described in the answer from @No Sssweat. Not the answer you're looking for? Browse other questions tagged users 8 or ask your own question. How can I make downloads available only to authenticated users? how to show a panel node only to authenticated users? How to create and hide user login link in drupal 7? How do I show a link to the user registration page only to anonymous users? How to add a Login / Logout link in Main navigation menu? How to make menu link show for certain roles?